Like 5 below (110/38) this drawing has yellow wash in addition to the predominant grey washes. The yellow wash probably indicates gilded surfaces, for it is used for the two carved mouldings of the fire surround cornice and for the moulded frame of the overmantel panel. The framed panel within the fire surround has a yellow background, suggesting gilded wood, and on this is a large symmetrical composition of a two-sided eagle's wing, backed by three trumpets and with a ribbon framing a WM monogram. The composition is intended as a relief carving as some cast shadows are indicated. The theme is of victory, but it is not carried up into the overmantel, where a blank frame is surrounded by fruit, flowers, drapery and birds, and the decorative elements are smaller in scale.Gibbons has drawn a trial of the WM insignia in brush and yellow wash on the drapery swag beneath the overmantel panel. 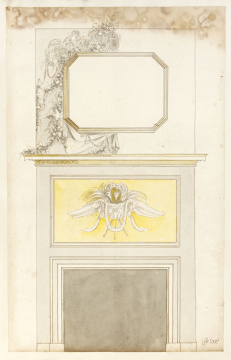 This suggests and unfamiliarity with the motif, and may be another indicator of an early date for this group of drawings.The decorative relief elements of the overmantel are rendered very flat in pen and wash, like all the relief carving in this group of five. There is spatial ambiguity in the relief composition. On the left side a drop of flowers is drawn against the side of the overmantel, without any overlap, but at the bottom one of the swags is made to lie across the mantel shelf and overhang the corner. Throughout it is not clear how deep the carving will be, or which features will stand forward of others. This is largely the result of an absence of clearly drawn cast shadow.The base of the drawing is the bottom of the sheet, but the drawing was probably trimmed back to this line, for on 110/38 the bottom of the sheet has been extended by the later addition of a narrow strip, presumably to repair damage to the original paper below the baseline.